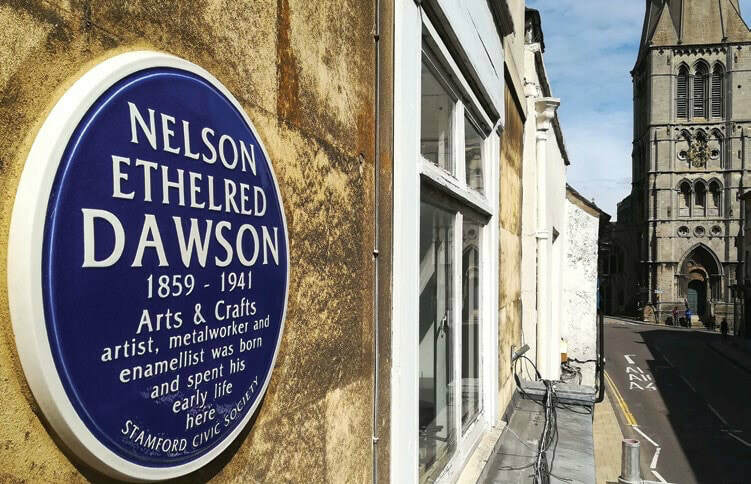 The Civic Society celebrated one of Stamford’s famous sons by installing a Blue Plaque to Nelson Ethelred Dawson on May 13th 159 years after his birth. 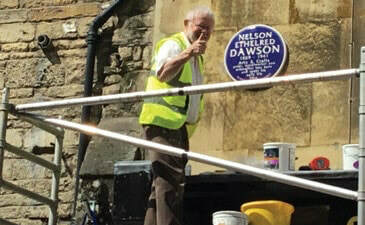 A group of volunteers sacrificed their Sunday lunches to help erect scaffolding and marshal pedestrians whilst ceramicist Ned Heywood MBE fixed the plaque. After carefully researching the census returns for 1861, 1871 and 1881 together with his birth certificate the Civic Society substantiated that Nelson Ethelred Dawson was born on May 5th 1859 at 8.20am at 7 St Mary’s Street. Previously it was thought he was born at 27 St Mary’s St at the site of the present Stamford Arts Centre but this proved not to be the case. Nelson was the son of Edwin Dawson and Emma Annie Dawson (née Harris) and the eldest of eight children. His father was a Master Baker. He attended Stamford Grammar School and remained a member of the Old Stamfordian Club all his life donating many of his pictures to the school. Regrettably it now seems that most of these have been lost. He then studied architecture at 69 Scotgate with Joseph Corby who designed the Burghley Estate Office on High Street St Martin’s. This apprenticeship appears to have nurtured Dawson’s love of painting. Dawson then moved to London (1885 – 1887) to study art in South Kensington and subsequently he moved to Scarborough where he met his wife Edith Robinson, a Quaker, with whom he would have a very successful professional as well as marital partnership. They married in Whitby in 1893. By this time Dawson had moved back to London. During the 1880s Dawson was essentially a seascape painter but by the early 1890s he was also undertaking a lot of metalwork. It is thought that he trained Edith whereby he became the designer metal worker and she undertook the enamelling. In 1901 Nelson, with Edward Spencer, founded the Artificers’ Guild which was a guild inspired by the Arts and Crafts Movement (c.1880 – 1920) operating commercially and also training craftsmen. He described himself as “metal worker, enameller and designer” for the Art Workers’ Guild. The Artificers’ Guild archive is currently held by the Goldsmiths’ Company in London. Nelson was also a committee member with the Art Workers’ Guild which he joined in 1891. There is no doubt he was an important craftsman of the Arts and Crafts Movement albeit one of the lesser recognised ones in comparison to William Morris, Walter Crane and Charles Rennie Macintosh. Well known examples of Nelson and Edith’s work are the bronze organ grille in Holy Trinity Church, Sloane Street, Chelsea, and the trowel and mallet used by Queen Victoria on her last public appearance laying the foundation stone for the V&A Museum in 1899. Nelson and Edith also crafted the casket presented to President Woodrow Wilson prior to the 1919 Versailles Peace Conference and gates for Kingston upon Hull Guildhall. Dawson wrote the “Goldsmiths’ and Silversmiths’ Work” published by Methuen in 1907. 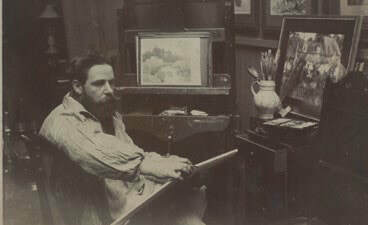 From 1914 he concentrated on etching and painting. He applied to be appointed an official war artist during World War I but was unsuccessful. He died in 1941 at Chiswick and it seems his burial place is unknown. Edith predeceased him in 1928. They had two daughters, Rhoda and Mary Ethel. In the Stamford Museum archival collection there are a large number of items related to Nelson Dawson. 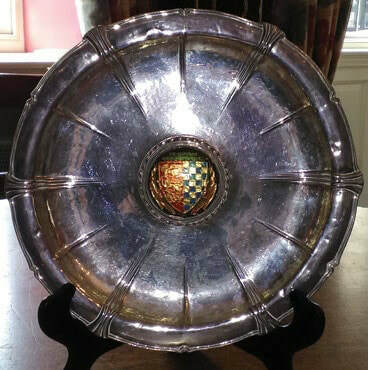 For further information about this collection contact sara.basquill@lincolnshire.gov.uk. 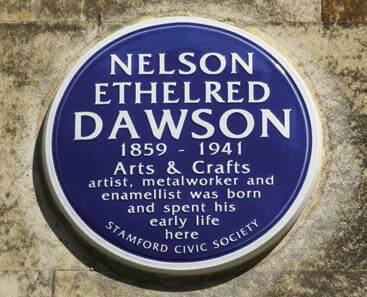 Ned Heywood of Heritage Ceramics, Chepstow, who made and erected the Nelson Dawson Blue Plaque also crafted the Civic Society’s William Stukeley plaque at 9 Barn Hill. The Society is very grateful to have received funding from the Harry Skells Trust to support this project. 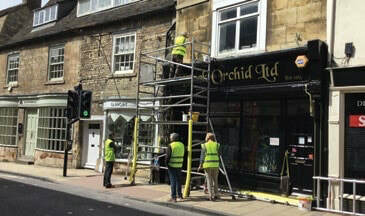 The project would never have got off the ground without the kind permission of the owners of 7 St Mary’s Street.